Guest speakers William Reese, Carl F. Kaestle WARF Professor of Educational Policy Studies and History, University of Wisconsin-Madison and Matthew Chingos, a fellow of the Brookings Institution, Brown Center on Education Policy, spoke on the history of testing and its economic cost. Chingos discussed his report, “Standardized Testing and the Common Core Standards: You Get What You Pay For?” Chingos’ discussed the cost of student assessment options for the Core Common State Standards curriculum. He noted that it is important to consider test quality in addition to cost when choosing an assessment. Sean Corcoran, an associate professor of educational economics in Steinhardt’s Department of Teaching and Learning, moderated the discussion. 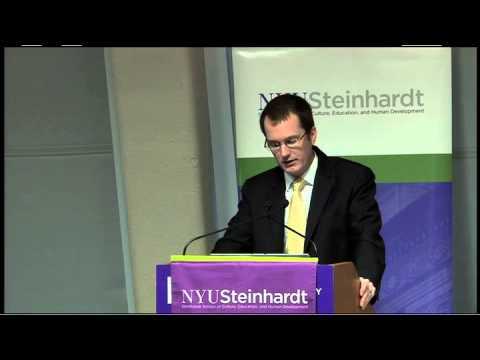 To learn more about Steinhardt’s Education Policy Breakfast Series, visit our site. Read all the tweets generated by this event on Storify.